One activity I miss most from my pre-parenting days is reading for several uninterrupted hours. Since becoming a mom, the number of books I am able to read cover to cover has greatly reduced. Fortunately I love children’s books, and I love to read aloud to my girls. A squirmy and sometimes resistant three-year-old and an infant who just wants to hold a book and chew can make my efforts a little challenging. I love children’s books, but as a new mom I find navigating the library a little intimidating. Wall to wall books can be overwhelming if you don’t know exactly what you are looking for. Thankfully my love of podcasts led me to a great resource for book recommendations—Sarah MacKenzie and her podcast Read-Aloud Revival. Sarah shares a love of reading and encourages families to build a family culture around books. And oh my goodness, I’m a little excited about her podcast. Before listening to Read-Aloud Revival, I probably used one of three methods to find books at the library: 1) Google “best books for toddlers” 2) Search Amazon’s most popular list 3) Just browse the face-out books at the library or Barnes and Noble. I’m not sure I considered what qualities made for a good children’s book, and I certainly didn’t know what twaddle was. Thanks to all the resources Sarah provides, I have more than 100 books saved to my children’s Amazon wish list. Now I just consult this list, and reserve books from the library online. The library gathers all the titles I request, and calls me when they’re ready to pick up. Now is that a sweet deal or what!? Sarah has interviewed some great guests, including Andrew Pudewa from the Institute for Excellence in Writing about reading aloud to older kids, Jim Weiss, professional storyteller, about reading aloud imperfectly and tips and tricks for reading aloud, and Jamie Martin, editor of Simple Homeschool about using the library without losing your mind. I particularly enjoyed Sarah’s recent podcast with Sarah Dahl and Haley Scharf about reading aloud with toddlers – the why and how. Sarah and Haley blog at Aslan’s Library sharing the very best theological books for children. This podcast certainly speaks to my season of life. The Read-Aloud Revival podcast has not only inspired me to read great books to my children, but has also served as encouragement for me to get back to reading. If you are looking for excellent book recommendations for children of all ages, head on over to the Read-Aloud Revival website. I highly recommend you listen to her podcast, but if you’re in a hurry, check out her show notes for each episode where she provides links to many quality books. Since it is quite the trend for bloggers who are parents to share what they are currently reading, I thought I’d jump right in too…here are a few books we have in our reading corner. My ABC Bible Verses by Susan Hunt This book is on our current rotation of books we read before bed. With bible verses for each letter of the alphabet and a corresponding story to help apply the bible verse to real life situations, it’s the perfect tool to help plant seeds of faith and truth into little hearts. 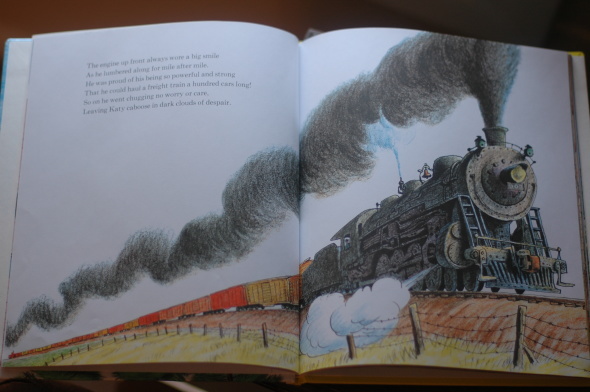 The Caboose Who Got Loose by Bill Peet – This book is perfect for the child who loves trains. Rhyming words and beautiful illustrations help make this a fun book to read aloud. We picked this up at the library and were sad to return it. Clutterfree with Kids by Joshua Becker – After my family was sick for a what felt like the entire month of January, we accrued and still do at times, 4 overflowing baskets of dirty laundry. Needless to say I am craving some minimalist living, and this book is my inspiration. Even if you’re not interested in de-cluttering your house, this book serves as a good challenge to rethink the things you keep in your home. This post just made my day. 🙂 I mean it. So glad it did! I look forward to each podcast episode, and enjoy each book I bring home that someone has mentioned on the show. Keep up the good work!